Massachusetts Agricultural College—UMass Amherst’s forebear—caused a sensation by first winning fame on the water. [Rowing] occurs within a simplified context that permits a clear view of what is effective and what is not. In crew there is no defense, only offense: winning boat races simply means moving faster than everybody else. They didn’t belong there. Nearly everyone agreed on that. In July 1871, the teams set to compete in the first regatta of the newly formed Rowing Association of American Colleges (RAAC) gathered on the banks of the Connecticut River six-and-a-half miles north of Springfield, Massachusetts. Savvy fans were struck by the fact that the regatta’s main event, the University Race, was to include a mere three schools. Even more surprisingly, while two of those schools, Harvard and Brown, were to be expected, the third was most definitely not: Massachusetts Agricultural College (MAC), widely ridiculed as being no college at all and so newborn that it was graduating its first class of seniors—all 27 of them—that very month. It was bad enough that the lineup lacked Harvard’s longtime rival Yale, absent in protest of a controversial call in a race the previous year. But why make room for a school that had never had a rowing team before the previous fall and had none of the social cachet and athletic finesse revered by the venerable institutions? Above: The only known photograph of MAC’s 1871 crew: (from left) George Leonard, Arthur Norcross, Henry Simpson, Gideon Allen, Frederick Somers, and Frederick Eldred. In that era before big-league baseball, before the invention of football and basketball, and before boxing emerged from the social shadows, rowing was America’s great spectator sport. In its collegiate sphere, Harvard had long been dominant. For nearly 20 years, it and Yale had been enmeshed in a perpetual competition that all but locked out other schools. Harvard devoutly held to two beliefs: in the all-round superiority of its community and in “scientific” racing as an expression of that superiority. The great exponent of New England Brahminism was Oliver Wendell Holmes Sr., of Harvard’s medical faculty. He proudly believed in a “harmless, inoffensive, untitled aristocracy” marked by a “congenital and hereditary” aptitude for scholarship and rightly entitled to be recognized as a ruling class. Holmes—himself an enthusiastic rower who feared that his cherished waterways might someday be “blackened with boats as with a swarm of water-beetles”—warned that “society” had too little regard for physical fitness. Rowing in the approved Harvard manner seemed a fine way to build muscle without sacrificing social standing. In first approaching the theoretical aspects of rowing, Harvard had turned to the English Orthodox style codified at the great British schools. By the time of the 1871 regatta, it favored what the New-York Tribune called the “well-known Blaikie or Loring stroke,” named for renowned Harvard oarsmen. Owing much to the smooth, rhythmic British ideal, it did more to foster team cohesion than muscle growth. 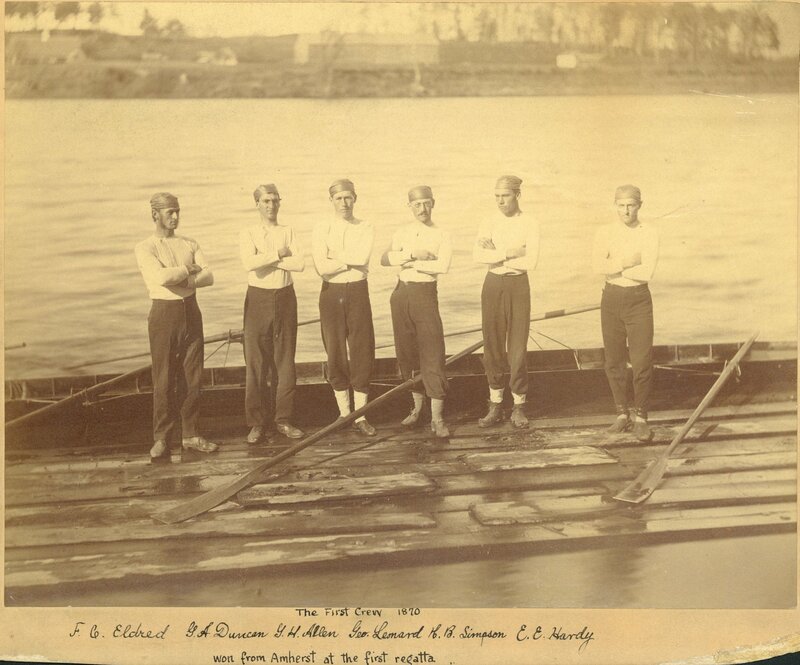 MAC’s 1870 crew, victors over Amherst College’s junior six: (from left) Frederick Eldred, George Duncan, Gideon Allen, George Leonard, Henry Simpson, and Edward Hardy. Eldred, Allen, Leonard, and Simpson went on to row at Ingleside the following summer; Hardy served as the crew’s commodore during both seasons. All of which might have amused Ward, a man variously described as rustic, slouching, invincible, taciturn, sententious, and crafty. He was all of that but may have been crafty most of all. Just how he came to coach the Aggies is a great question. It is unlikely that the team—whose total assets the previous fall had amounted to the $100 used boat they had just bought—could have afforded to hire him. It is tempting to speculate that, at a time when gambling on river races was both rampant and legal, he saw a chance to get an edge and make a killing. His actions leading up to the race certainly suggest that he did. Ward later said that he had sensed the Aggies’ potential and quickly confirmed that they were “fine material.” They had, after all, come to the sport the previous October with virtually no experience on the water. They were physically unprepossessing, averaging five feet, eight inches in height. They trained hard, walking the three dusty miles from campus to the river and the ramshackle tobacco barn where they kept their boat, then rowing three miles and jogging back to campus by a roundabout route. Within weeks, they raced Amherst College’s junior team and won. Perhaps Ward had gotten wind of that. Time now being short, Ward chose not to subject the team to his most severe training. He put the Aggies on a “coarse diet”—heavy on rice, oatmeal, dry toast, roast beef, and beefsteak, much like what the other teams were eating. Ward saw no harm in allowing his boys to drink modest amounts of ale—off-limits to their competitors—but was not otherwise indulgent. While the Harvard and Brown men were driven back in carriages from their practice runs, the Aggies rowed. And Ward had them work out in the relatively ungainly six-oared outrigger shell they had first bought rather than the sleeker model they had since purchased from Amherst College; that was saved for the race. Ward played along. “Yes, they are good men enough,” he said before the race, “if only I could make the damned fools row!” Snobs crowded round the Aggie boathouse to goad him. “Have your duffers come down yet from the haymow?” they jeered. “Have your farmers gotten the hayseed out of their eyes?” Ward only smiled. The race’s course had been chosen in deference to the wishes of the proprietor of a lavish hotel complex called Ingleside, two-and-a-half miles south of Holyoke and set on a plateau high above the Connecticut’s west bank. Beginning at a set of five boathouses on the river’s east bank, three-quarters of a mile due east-northeast of the hotel, the course ran three miles south, ending at a long, covered toll bridge between Chicopee and West Springfield. The course was first run in earnest on Wednesday, July 19, when Harvard’s university team (as opposed to its freshman crew, also on hand) raced the nation’s finest amateur team, that of the Atalanta Boat Club of New York. Harvard was missing some key men; its captain, Nathaniel G. Read, conceded that his team was discouraged but determined to do its best. The oddsmakers wisely banked on Atalanta: it came in at 18 minutes, 19½ seconds, with Harvard turning up a minute and three seconds later. The racecourse, as superimposed on an 1887 U.S. Geological Survey Map. By late Friday afternoon, July 21, crowds were gathering, mostly at the boathouses, the hotel, and on and beside the Chicopee bridge. Harvard fans were on hand in great and enthusiastic numbers, but the other teams also had their fair share of backers. Many who resented the 25 cents the hotel was charging to enter its grounds stood in poison ivy down by the river. The sun began to set in a brilliantly clear sky, casting a golden hue over the placid river. By 7 p.m., after many delays, the call came for the teams to line up. Brown, having won a coin toss, chose the best spot, nearest the east shore. Harvard was in the middle; the Aggies got the least-desirable, westernmost position. At Ingleside, the start of the race was obscured by a curve in the river. The hotel’s verandas, packed tightly, included many Harvard loyalists itching to see their boys lead the pack round the bend. Then came the boats and a horrified shout: “Good God, there’s Amherst, and I’ll be damned if she isn’t leading!” Joy from Aggie supporters and many nonpartisans; consternation from the Brahmins, and desperate hope that this ungodly, inconceivable fluke would soon end. It didn’t. The Aggies pulled in a manner “not scientific, but strong and long,” one that experts compared to those favored by Atalanta and the Wards. As the Aggies approached a second river bend, this one leading to Chicopee, they were far enough ahead that onlookers found themselves wishing for a tighter race. On the riverside road to the bridge, clouds of dust rose as riders drove their horses hard to keep up with the Aggies. On the bridge and the sandy shore at its western side, a massive crowd waited to see the race’s end but had no idea when it might come. Bored with staring at the bluff that blocked their view upriver, boys near the judges’ stand filled bystanders’ pockets with sand and did handsprings. Big-city bookmakers in superbly polychromatic vests strutted about calling for last-minute bets but found few takers, since everyone knew that Harvard would win. Harvard men prayed for vindication after the Atalanta race; Brown fans sang college songs and swore eternal fealty. Swains flirted, sandwiches and champagne were consumed, men and boys sent stones skipping over the river. One hundred and fifty yards from the end, Leonard looked over his shoulder and, catching sight of the stake boat marking the course’s end, urged his crew on. From a nearby boat, someone shouted, “How are you making out?” Leonard grinned and called back, “Oh, we’re slidin’ along.” On shore, supporters howled “Oh, Amherst” and “Go it, Aggies,” danced madly, pounded one another on the back. By now, the Aggies were a good 12 or 14 lengths in front of Harvard, with Brown pulling up the rear. Hardy bellowed, “Sock it to her, Georgie!” Leaving nothing to chance, the Aggies sped past the finish line, under the bridge, and well beyond. The happiest among their admirers might have been MAC President William Smith Clark, who all along had sung the team’s praises and had even excused the seniors in its ranks from attending commencement to avoid breaking their practice. He had come down with a team of Morgan horses leading the bus-like carriage he owned to transport his brood of children (they eventually totaled 11). Several of them were with him. Now, as the crew nervously disembarked on the sand beneath the bridge, Clark, having already thrown his hat in the air, ran down nearly into the water, clapped his boys on the back, and said that he “would rather they should ‘flunk’ on the stage”—he presumably meant the commencement stage—“than lose the race.” Then he sped back to Amherst to stand in his carriage beside the town green shouting the good news. The Aggies, after taking in the roaring applause of their supporters old and new, rowed back upstream, looking a bit bewildered. Back at the boathouse, the Aggies were hugged by an overjoyed Josh Ward. At the hotel, they ran a gauntlet of hugs, handshakes, and free expressions of admiration from ladies of all ages. Each of the six team members was presented with a prize: a miniature silver barge, gold-lined, with a winged cherub holding a pair of oars. There were cheers for the team, for Ward, and for the other teams, clubs, and individuals. The merrymaking went on deep into the night. Within days came what seemed to be new cause for joy: the announcement by the race’s timekeepers that, in checking their math, they now realized that the Aggies’ time had in fact been a minute less than first calculated and was the fastest on record for a three-mile run. Some savants protested that that was simply not possible; besides, they asked, wasn’t it glory enough for anyone to have bested Atalanta by as much as the Aggies had earlier been credited with? Be that as it may, when the victors had a celebratory banner made, they made sure that it bore the faster time. MAC’s victory was revolutionary in at least one further sense. For years to come, it inspired colleges large and small to compete, expanding the field exponentially and doing much to shape American collegiate athletics as we know it today. We know little about the individual members of the Aggie crew of 1871. The list below offers basic information. The quotations are informal notes made by MAC President William Smith Clark the year after the race; the information about the members’ subsequent careers is taken from a 1901 alumni report. The lead image in this article is the only known photograph of the crew.